Here comes the notification on the SSC Official website related to the Jr. Translator SSC Registration Form. So those who are looking for the SSC Online applications for the Jr. Translator posts can apply for this SSC recruitment process 2018. The SSC (Staff Selection Commission) will conduct an open competitive CBE (Computer Based Examination) for the Combined Recruitment of Junior Hindi Translator, Junior Translator, Senior Hindi Translator and Hindi Pradhyapak Examination, 2018. SSC Conducts this Jr. Translator examination every years to recruit eligible candidates under centre Government of India. So those who are looking for the SSC jobs can filled up this SSC Online application form through the SSC Official website only. SSC Registration form will be active on 22nd Oct. 2018 for applying this Jr. Translator examination. So candidates can apply online through the SSC official website before this date and the link will be remain activated up to 19th Nov. 2018. More information related to this SSC Recruitment is given below in this article. We advise all fresher candidates who are interested in these SSC jobs to read this article carefully before moving to SSC Online application for Jr. Translator examination 2018. Having a Master’s degree in Hindi with English as a compulsory or elective subject from a well-known university can apply for this SSC Recruitment. Those who have completed their Master’s degree in English with Hindi as a compulsory can also apply. Master’s degree of a recognized University in any subject other than Hindi or English, with Hindi medium and English as a compulsory or elective subject or as the medium of a examination at the degree level and Recognized Diploma or Certificate course in translation from Hindi to English & vice versa or two years’ experience of translation work. Graduation’s degree with Hindi and English as main subjects can fill up SSC Online Application form for this post. Must have a Graduation’s degree in Hindi with English as one of the subject at degree level either as compulsory or optional. Age Bond: All applicants whose age is less than 30 years can apply for this SSC Recruitment process. This age limit is for all Job profiles which comes under this SSC Jr. Translator Examination 2018. Paying Method: Those who are going to apply online through the SSC Registration form which are available on SSC Official website have to pay the above application fee structure. Candidates can use the following methods for the payment of the application fee: “Debit Card, Credit Card, Net Banking”. SSC Registration form will be online and candidates needs to apply online through the SSC Official website only. 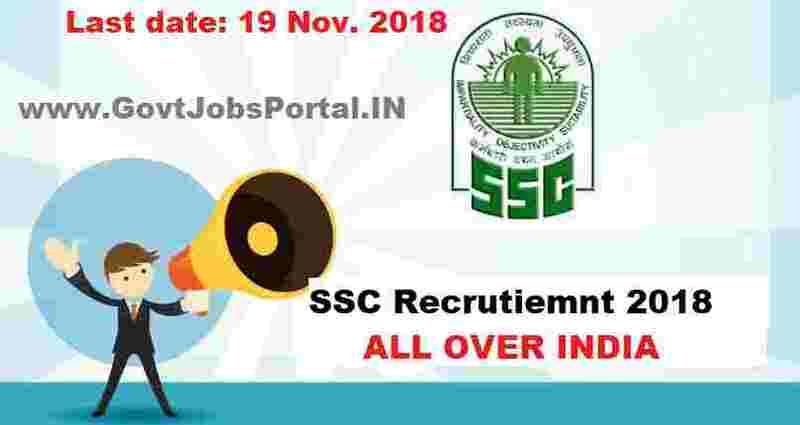 There is no other way for applying these SSC jobs 2018. (a) SSC online applications are mandatory to be submitted in online mode only at the SSC official website i.e. https://ssc.nic.in. 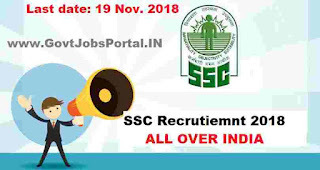 Under IMPORTANT LINK section below we share the direct link for online application form related to this SSC Recruitment process. (b) Last date for submission of online applications is 19-11-2018 (5.00 PM).So all the applicants have to apply online before this this date. Currently the link is active for this SSC Recruitment. 22ND Oct. 2018 is the Opening Date Apply. 19th Nov. 2018 is the Last date to Apply.